Seder attendance has long been regarded as a key marker of Jewish affiliation. In fact, far more Jews regularly attend a Seder than fast on Yom Kippur. A fascinating 2013 Pew research poll showed that 70 percent of all American Jews attend a Seder; 53 percent fast all or part of Yom Kippur; 23 percent usually light Shabbat candles; and 22 percent keep kosher at home. The message in this lovely fusion of themes is both obvious and touching; just as the Jews in Northern Africa overcame the Egyptian enemy with G-d’s help in Biblical times, so too the Americans and allied forces will ultimately succeed in defeating the Nazis in North Africa. V-Mail – short for “Victory Mail” – was a hybrid mail process developed by Eastman Kodak and used by America during WWII as the primary method to correspond with soldiers stationed abroad. To reduce the cost of transferring an original letter through the military postal system, a V-mail letter would be reviewed by censors, photographed, and transported as a thumbnail-sized image in negative microfilm. Upon arrival at their destination, the negatives would be blown up to 60 percent of their original size and printed. Another important benefit of the V-Mail system was that it prevented espionage communications since invisible ink, microdots, and microprinting could not be reproduced in a photocopy. Received this week two answers, end September, beginning November. Best Holiday wishes. Celebrated beautiful Seder. Are confident in future to see you soon. Shanghai was an important safe haven for Jewish refugees during the Holocaust because it was one of the few places in the world that didn’t require a visa to enter. Some 23,000 European Jews found shelter there, and several Chinese diplomats issued protective passports and transit visas to Jews and others fleeing the Holocaust. Later during the war, occupying Japanese forces relocated the Jewish “stateless refugees” to an area less than a square mile in Shanghai’s Hongkou district, which included the community around the Ohel Moshe Synagogue. Japanese authorities progressively adopted additional restrictions, but the ghetto was not walled, local Chinese residents did not leave, and American Jewish charities were able to assist the Jews there. Late in the war, the Nazis pressured the Japanese army to develop a plan to exterminate Shanghai’s Jewish population. However, this attempt to bring the Holocaust to China became known to the Jewish community’s leadership and, with the intercession of the Amshenover Rebbe, the Japanese – who, in any case, had little motive to further antagonize America and the Allies after they had already invaded China – delayed the German request until the war ended. After the war, many of the Jews in Shanghai immigrated to Eretz Yisrael and helped establish the State of Israel. 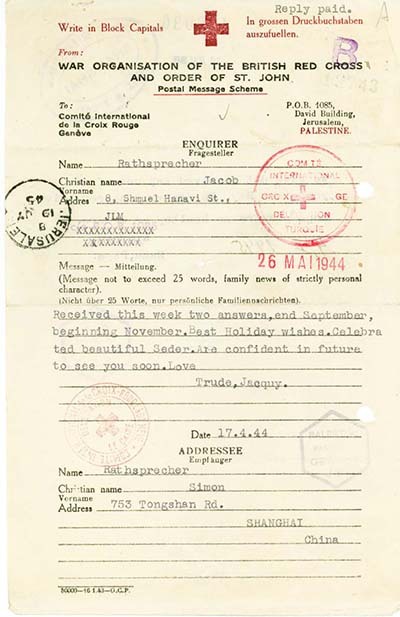 This Red Cross postal message stands as a historical testament to the important and generally unrecognized role China played in saving Jews during the Holocaust. 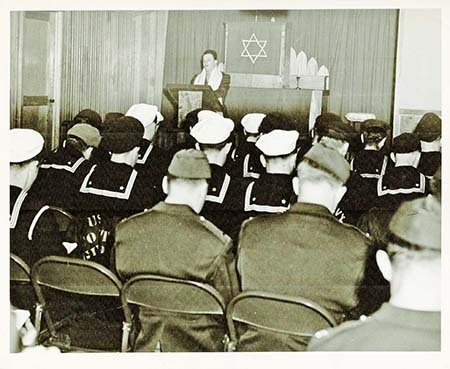 Jewish Coast Guardsmen, thousands of miles from home, attend Passover services at a chapel at an Arctic outpost. Theirs is one of the toughest duties, serving on board the sturdy Coast Guard sea craft which penetrate deep into the ice-filled seas. In recent years, Jews have celebrated a siyum masechta on Antarctica; Chabad has printed and distributed a Tanya there; and kosher Pesach cruises travel there. 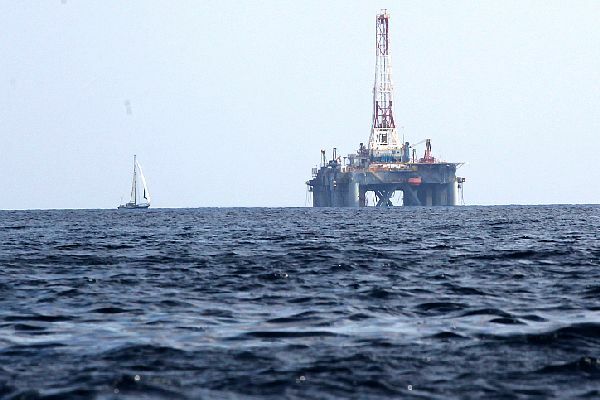 Once upon a time, the Nazis sought oil there. Exhibited here is a beautiful 1948 postcard extending Passover greetings from Hawaii. It depicts three Jewish navy servicemen at a Seder table complete with a Seder plate, wine glasses, matzah, and a candelabra as they read from their haggadot. It features the words “Guam 1948,” typed by a father on duty who wrote to his children about how much he loves them and misses being with them for Pesach. Guam, the southernmost island of the Marianas archipelago in the western part of the North Pacific Ocean, is just under 4,000 miles from the naval air station in Pearl Harbor from where this card was issued. 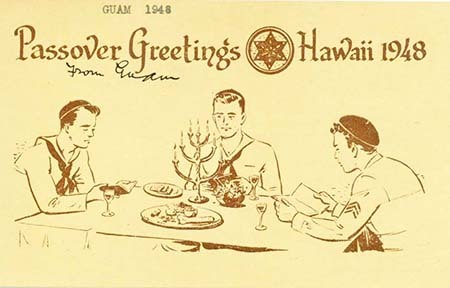 The first United States Army Seder in Hawaii was held in April 1944, four years before this card was issued. 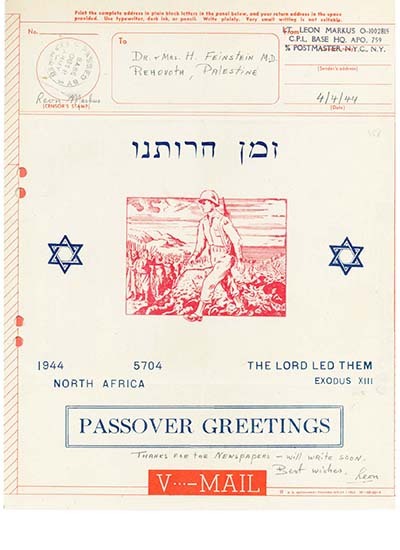 This card depicts a Pearl Harbor Seder, but the correspondent probably attended a Guam Seder. Interestingly, a historic Seder took place in Guam on March 28, 1945 – reportedly the first Jewish religious rite ever held in that part of the Pacific Ocean – at a time when American troops were about 1,400 miles from southern Japan, but getting ever closer with each island captured from the Japanese. Attended by 2,700 American servicemen(! ), it was conducted by Rabbi Major David I. Cedarbaum, an Army chaplain serving on Guam. The soldiers, who gathered around makeshift tables under palm trees set in open-sided canvas tents, ate matzah, gefilte fish (of course!) with horseradish, hard-boiled eggs, parsley, and sweet-and-sour beets. 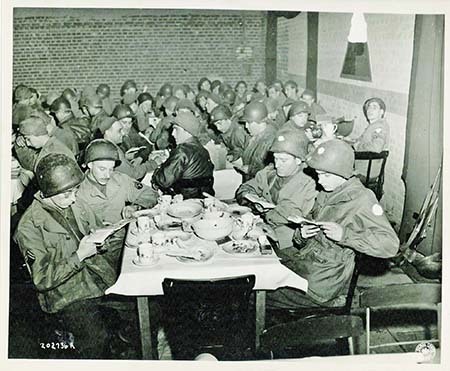 They read from the famous “Guam Haggadah,” which was printed by the 20th Air Force’s 949th Aviation Engineer Topographical Company for their use (a copy of which may be seen at the Dorot Jewish Division of the New York Public Library), and a recording of the Seder service was broadcast to soldiers in hospitals in the Marianas, many of whom had been injured fighting on Iwo Jima. Shown here is an original news photograph of one of the first public Seders held in the land of the Final Solution after World War II., On March 28, 1945, while this Seder was being held with over 1,500 troops and visitors, the Allied armies struck with full armored power along the German 200-mile battle line east of the Rhine in a series of breakthroughs that sent American tank columns to within some 200 miles of Berlin. Hundreds of tanks swept ahead of advancing infantry divisions and sped virtually unchallenged across the flaming Third Reich, with the entire German front seeming to have disintegrated. Wishing all a chag kasher v’sameach.